The Sydney Roosters is a professional rugby league football club based in the Eastern Suburbs of Sydney, Australia. The club competes in the National Rugby League and is one of the most successful clubs in Australian rugby league history, having won twelve New South Wales Rugby League and National Rugby League titles, and several other competitions. Only the South Sydney Rabbitohs and the St. George Dragons have won more premierships. The club holds the record for the longest winning streak, and the second greatest margin of victory in Australian rugby league history. The Roosters is the only team to have played in each and every season at the elite level. The club was founded in 1908 in Paddington, Sydney, under the name Eastern Suburbs; in 1995 the name was changed to the Sydney City Roosters and, in 2000, to simply the Sydney Roosters. The Bondi Junction and Moore Park-based Roosters have a long-standing and fierce rivalry with other Sydney-based clubs, especially the Rabbitohs, a fellow foundation club based in neighbouring Redfern. Eastern Suburbs did not traditionally sport a crest on their jerseys in the first half of the 20th century. Other clubs occasionally sported simple designs on their strip; however, this was not seen consistently on all jerseys until the 1950s and 1960s. In 1967, the club introduced the first logo, displaying the motto "Easts to Win", following a winless season. The crest also incorporated a rooster or cockerel in the design; one source suggested that this choice of mascot followed after the Roosters' jersey design was inspired by the French national team's jersey. Given that the French team's mascot was affectionately known to supporters as le coq, "the rooster", connections have been made as to the choosing of a rooster for Eastern Suburbs' mascot. In 1978, the motto was replaced with the team's name, "Eastern Suburbs". This name was kept until 1994, when the club changed its playing name to the "Sydney City Roosters" for the start of the 1995 season to expand the club's widening fan base. 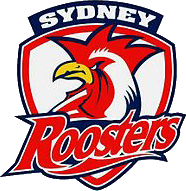 In 2000, the club changed its name to the "Sydney Roosters". Although marketing names have changed, the Roosters are still registered with the National Rugby League competition as the Eastern Suburbs District Rugby League Football Club.